Around the world and across the Internet, July 26 is known as SysAdmin Day. For 14 years, the last Friday in July has been set aside as a way for users to show a little appreciation for the SysAdmins that keep their systems running, their email free of spam, and their ability to Like comments intact. Consider that your own SysAdmins deserve a little show of appreciation. To say “thank you”, here’s a list of 26 simple ways you can show your appreciation for those unsung heroes that toil away to keep the servers humming and the tubes unclogged. Some of these are low cost gestures; others might be something the boss should cover or the office should take up a collection, but all are guaranteed to put a smile on the face of that favourite SysAdmin of yours, on the one day a year where you know better than to drop a broken machine off or open a last minute helpdesk ticket. When you care enough to send the very best, but you don’t have a lot of money to invest, a nice card at least shows some thought. Just make sure it is a card themed around IT, general geekiness, or otherwise shows that you didn’t pull one out of a card drawer because you forgot about it. Whether your SysAdmin’s favourite brew comes from Starbucks or the local shop down the street, a gift card is the gift that keeps on giving, or at least for a couple of cups of really good Joe. If coffee isn’t their thing, you can bet a gift card to the iTunes Store, Google Marketplace, or Windows Store will be appreciated. Find out what kind of phone they have and get the card to right shop and you can bet that by the end of the day they will have a couple of new apps to try out. While this may be the fallback of last resort, even people ten years in the grave can find something at Amazon that they want. You’d be amazed at how far a nice lunch can go towards saying thank you, especially since that SysAdmin usually eats lunch at their desk because there is so much work to do. Whether it’s a one on one affair, or you make it a team event, just providing them the opportunity and excuse to see the sun at least for one day a year is a great gesture to make. Better still, buy your SysAdmin dinner, by getting him or her a gift card at a nice restaurant so they can take their significant other out for a nice meal. Remember, every time you call your SysAdmin after hours to fix something, you are impacting their family too. Thank Yous should extend to them as well. The icon of geek and snarkiness, the Red Swingline Stapler is something every SysAdmin will love. With a simple conversation, you can quickly find out what your SysAdmin’s favourite sci-fi TV show or movie is, and then a quick visit to ThinkGeek will provide you with tons of options for low cost, but very cool, thank you gifts. Very few adults will ever buy themselves a Sonic Screwdriver, but secretly, we all want one! Use the same recon skills as above, but this time visit Amazon for cool movie posters or other theme art so your SysAdmin can pimp their cube in style. Here’s one the whole office can enjoy, and EVERYONE loves pizza. And since SysAdmin’s day is on a Friday, it’s a perfect fit for the day. Part silly putty, part play-dough, part caulk, and completely awesome – Hacking Putty can be used to fix or enhance almost anything. Did you know that Zombies are “in” right now? Anything from the Walking Dead to World War Z to remakes of George Romero movies are selling like mad right now, and thank you gifts that play into this will bring a smile and a chuckle to any SysAdmin’s face. Long hours mean a need for caffeine and sometimes coffee just won’t cut it. A case of Bawls is a delicious and refreshing way to hold of sleepiness during those late night changes. And these can not only fight off fatigue, but bad breath as well. It’s a multitasker, and any SysAdmin will appreciate that! Of course, too much caffeine can be a bad thing. Many SysAdmins have discovered the benefits and the deliciousness of a good cuppa, and herbal teas can help you relax without hyping you up. Show your SysAdmin you care without feeding their addiction. Everyone needs more power, and when your cell phone is dying, nothing is more helpful than some emergency power. USB batteries come in a variety of sizes and capacities, and can save the day time and again. Can you tell coffee is a big deal to SysAdmins. A cool coffee mug makes a statement, and can also handle those herbal teas. Look for one that plays to the TV or movie tie in for bonus points. A SysAdmin’s folk hero, anything that Neil Stephenson was involved in creating will be a greatly appreciated gesture, and you will go up at least five points in the recipient’s opinion. Velcro is so over. The new hotness is cable organization using silicone polymers and oddly-shaped, brightly colored widgets to keep cables in place, bound together, or otherwise organized. Everyone wants one… but many people think they will look silly if they buy one for themselves. Help your SysAdmin get past that mental block. 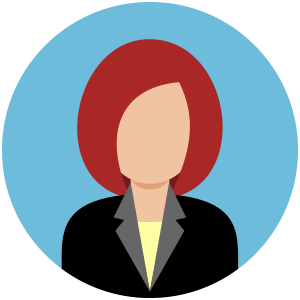 If disaster ever strikes, you know they will know how to McGyver something out of the bracelet to save you all – or at least, your email. Free speech, free beer, it’s all good. Find out their favorite and get them a case. It’s the kind of gift that says…you work your #$(& off, thanks, now have a cold one! 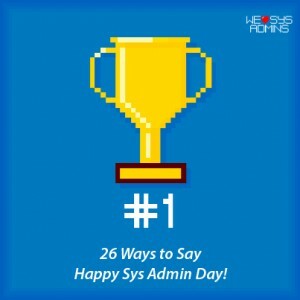 Twenty-six ways to say thank you to a SysAdmin that toils indefatigably for you 24/7/365. It’s one day a year that you get to really show your gratitude to them, so pick one from the list above, and remember your SysAdmin this Friday! Ohh if only there are more days to appreciate the work of us System Admins. Create list by the way, shared it with a couple of friend in the office….hint hint!!! I agree L.Schiano! Sys Admins work so hard they really deserve more than one day a year to receive appreciation – that is why we felt we should turn it into an entire week at least.